Ankle sprains are unfortunately very common in all age groups from teenagers to centenarians. With summer approaching and more of us getting outside, one might want to prepare for prevention of ankle sprains or know what to do if you sprained your ankle. Because severe ankle sprains can have symptoms similar to a broken ankle/foot, it’s good to try and distinguish between the two so one can identify if an x-ray and medical attention is needed. Both are going to be accompanied by pain and swelling. An ankle sprain typically only has swelling on the outside of your foot, around the distal malleolus. The ligament Anterior Talo-Fibular is typically the one injured. 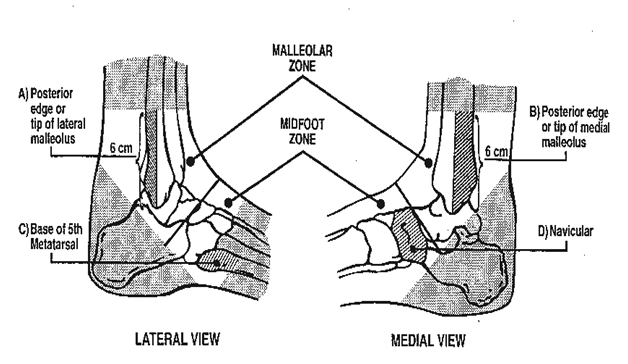 A fracture will typically have swelling around the ankle (front and sides) and down into the foot. Both are going to hurt with movement and when putting weight though it. The main difference is where the pain is located. Most healthcare professionals use the Ottawa Rule to decide if an x-ray is needed (which will distinguish between a sprain and a fracture). If none of the above is true, then the injury is likely a sprain. Sprains require Rest, Ice, Compression and Elevation (RICE) for a few days until the swelling and pain start to decrease. Then one can start moving the ankle slowly. Trying to write the alphabet (in the air) with your foot is a good way to start getting movement in your ankle. One will notice that some letters are difficult and painful to make. One should initially write the letters that are less painful and then move onto the letters that were more difficult. Once your ankle has full movement (can make all the letters without pain), one can start the strengthening phase. Having good balance is a must for your ankles. Being able to stand on one leg for 30 seconds while tossing a ball to yourself is a great way to strengthen your ankles and improve your balance. This exercise can be challenging, so start with standing on one leg for 10 seconds. As you get better and can hold the stance for 30 seconds, then you can add in a ball toss. Standing heel raises. Initially you can hold on to a table. With feet together, lift the heels of your foot and then lower. If you can do this 20 times with no problem, then repeat with just standing on one leg. The goal is to be able to perform 20 on a single leg without holding on to anything. Depending upon the severity of the ligament sprain, a sprain can take up to 6 weeks to heal and a few weeks longer to return to sports. Being patient and remembering to follow up with strengthening and balance activities is a great way to decrease the chance of future ankle sprains.